President Donald Trump's top allies in the White House and the media are escalating their feud with Senate Majority Leader Mitch McConnell. Over the past several days, McConnell has repeatedly urged Trump to stop tweeting and to be patient with major reforms, reflecting a frustration among congressional Republicans that the president does not understand that crafting major legislation and rallying support is a tedious, time-consuming process. "Our new president, of course, has not been in this line of work before," McConnellsaid at a rotary club earlier this week. "I think he had excessive expectations about how quickly things happen in the democratic process." He added: "Part of the reason I think people think we're under-performing is because of too many artificial deadlines unrelated to the reality of the legislature which may have not been understood." While the president has lamented Republicans' failure to pass a healthcare replacement bill, some Trump officials have pinned their complaints directly on the majority leader. 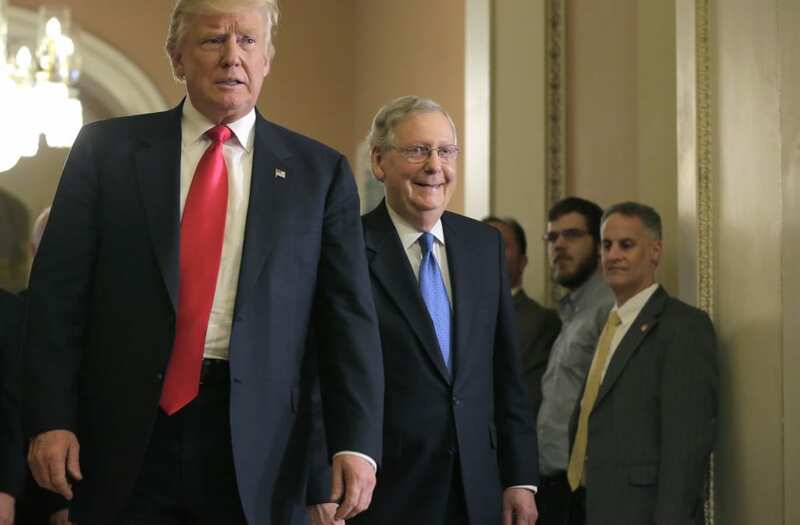 And Trump himself jumped into the fray on Wednesday afternoon to respond to McConnell's comments, tweeting, "Senator Mitch McConnell said I had 'excessive expectations,' but I don't think so. After 7 years of hearing Repeal & Replace, why not done?" Trump's tweet came after White House social media director Dan Scavino, who has long been seen as the president's id, blasted the majority leader earlier in the day for failing to repeal the Affordable Care Act. "More excuses. @SenateMajLdr must have needed another 4 years - in addition to the 7 years -- to repeal and replace Obamacare....." Scavino tweeted, referencing the leader's comments. In recent days, Trump's allies in the media also kept up their pressure on McConnell, who has become increasingly unpopular among conservative media figures online. Despite his pledge to take a brief hiatus from political pettiness, Fox News host Sean Hannity called for the leader to resign. "Fox & Friends" host Steve Doocy similarly on Wednesday chided Republicans in the Senate for failing to pass significant legislation in Trump's first days in office, saying it could lead to potential electoral losses. Since Trump jumped into the presidential race in 2015 and eventually ascended to the presidency, he and McConnell have maintained a strange relationship. Earlier this summer, the majority leader observed that unlike other GOP leaders, he'd largely avoided Trump's public wrath. Many right-wing and conservative commentators have lamented the inability for congressional Republicans to pass their version of a healthcare bill despite maintaining control of both chambers of Congress. Pro-Trump media figures blamed House Speaker Paul Ryan after the House healthcare bill momentarily stumbled earlier this year before eventually passing. "It's time to fix this mess that you have made for the president, and it's time for you to give the American people a bill that you have now promised them for almost eight years," Hannity said in May. "For the love of God, after eight years, can you please do your job?"